He was an outstanding all-around athlete, but hockey was his favorite game. 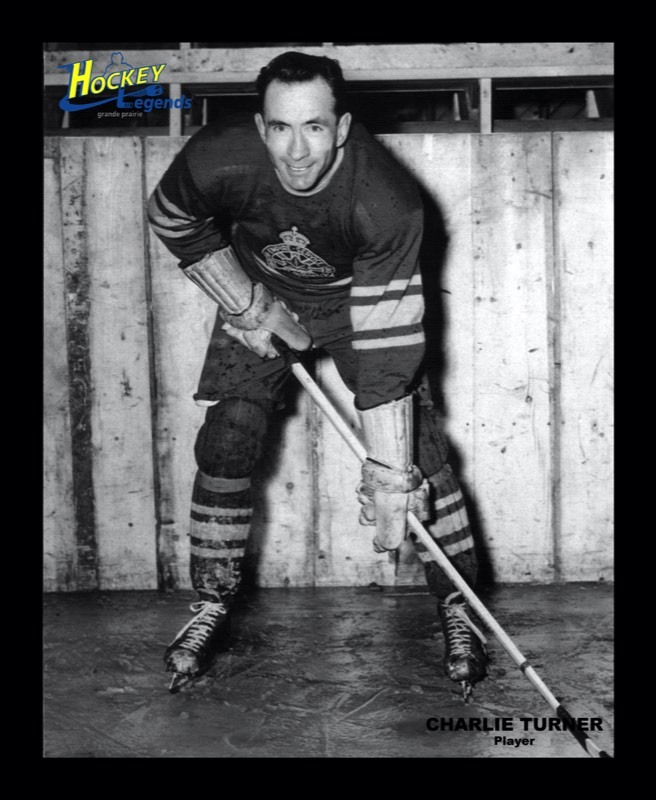 In 1979, the Herald Tribune's Bill Scott referred to him as, "King of the Grande Prairie Hockey Hill," and following in the tradition of Johnny Macdonald, the first Mr. Hockey, the title was passed to Charlie Turner. Like others in his era, he learned the game on ponds and open-air rinks where standard equipment included a snow shovel. At first, skates were unaffordable so he slipped his shoes into Dad's skates. With soft hands he used a one piece, straight blade wooden stick playing it like a fine fiddle. His wrist shots found the back of the net with unerring accuracy. The Red Devils, who represented Grande Prairie in the Northern Wheat Belt League, had a pre- and post-war history. Charlie played on both teams first joining the senior squad in 1934 at age seventeen. His Dad was a ref and his Mother the most faithful of his many fans. In 1942 he was drafted, serving his country in the Canadian Army Intelligence Corps. While overseas he toured Scotland with an All-Star army team along with several former NHL players. His teammates included Boston Bruin “Hall of Famers”, and members of the “Kraut” line, Milt Schmidt, Woody Dumart and Bobby Bauer. Charlie was certainly an NHL caliber player but following the war he was content to return home playing continuously with the D-Company, the Legion, the Red Devils and the original Grande Prairie Athletics. He played the game until he was 72. He was an iron man among iron men noted for scoring big goals and winning scoring titles. In 1959 The Wheat Belt Hockey League honored him with the Most Gentlemanly Player Award in recognition of his intense but clean, fair play. Grande Prairie is proud to preserve the memory of a highly skilled player with sterling personal qualities. As a talented sportsman Charlie was a fan favorite but more importantly, he became a model for many young, aspiring hockey players as he quietly tutored and influenced by example. Charlie Turner - a Grande Prairie Hockey Legend in 2004.